winter and ground feeding became dominant (see Fig 2). Data collection for the survey's second and final winter is already in full swing. Meanwhile, we already have some tantalising provisional results that show the kind of new science that is hidden in the first winter's data. The two charts to the right are by no means a final conclusion: indeed there is a long way to go to tease out the complexities that are summarised here and work out the conclusions that can reliably be drawn. 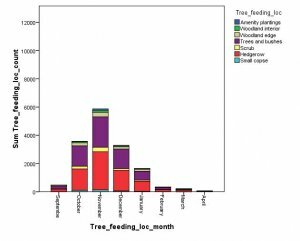 A major part of the analysis is likely to centre around the seasonal change from feeding in trees and bushes (Fig 1), which peaked in November, to feeding on the ground later in the winter (seen by comparing the timing of the peaks in Figs 1 & 2). This change was evident in all the thrush species and stems from their use of berries and fruits in hedgerows and trees until those supplies run low, followed by foraging on the ground, mainly for fallen fruit or for soil invertebrates. We are investigating how the timing of this change varies with species and region and your new data will show whether similar patterns will emerge in 2013/14. 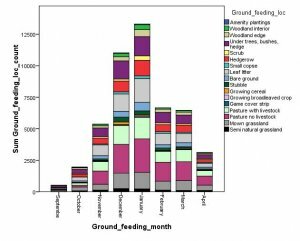 Subdivisions of the bars on the histograms suggest rather little proportional change between feeding locations as winter progresses, other than between 'tree feeding' (Fig 1) and 'ground feeding' (Fig 2). and dominated strongly into the spring. Observations on foods taken by thrushes during the first winter of WTS also show seasonal changes that may relate to the ripening of fruits and berries and their subsequent depletion. The massive scale of WTS observations will allow us to document the winter feeding behaviour of thrushes in far more detail than ever before. And results of the core surveys, on randomly selected sites, will help us differentiate between observer and thrush location preferences.